This will be a FIRST hearing on Property tax reform and relief and our supporter need a GREAT turnout of property taxpayers to set the tone. SB2 represents essential property tax REFORM that is critical to have in place to protect any actual RELIEF they come up with for the over burdened property taxpayers. 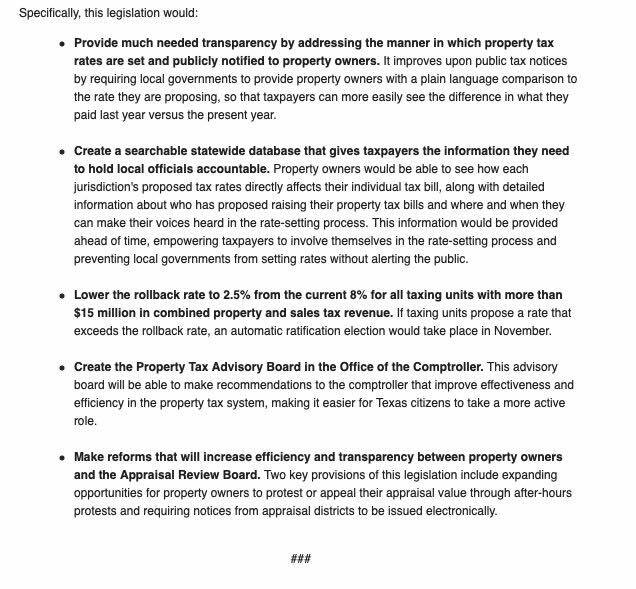 This reform restricts future growth of your property taxes to 2.5% without a MANDATORY vote by the people on a standard election day in November. Without this, if the state were to arrange other reductions to this component, the appraisal districts could wipe that out in one year. Realize this is a SMALL start and a school financing piece is being worked separately. But if support for this is not shown by activist taxpayers, the next pieces of reform & relief will just evaporate, crushed by the professional political class. Registration for the hearing begins at 8am and the earlier registered, the earlier you’ll be called for your 3 minutes. The testimony does not actually start until 12:30pm and will run late in the day. That morning and early day time can be very valuable to visiting various offices. to register your support for SB2 and the identical HB2 in the House. I would start with the House members of the Ways & Means committee, since the Senate Property Tax committee will be hearing from you in the hearing. Also go by oyur LOCAL reps offices- and be sure to go by the Speaker Bonnen’s and the Lt. Governor Dan Patrick’s offices to thank them or their support and unity on property tax reform and relief. In the lists below, our ‘BEST friends’ are in bold; the others need various levels of ‘selling’. Democrats are italicized but don’t pass on ‘selling’ them as well. Cole & Rodriguez are from Travis county & their communities are being DECIMATED by rising property values & taxes. This entry was posted on Saturday, February 2nd, 2019 at 12:41 am and is filed under Uncategorized. You can follow any responses to this entry through the RSS 2.0 feed. Both comments and pings are currently closed.